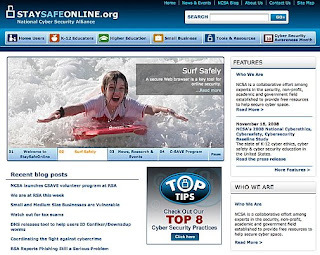 Mediabarn launches new NCSA site redesign and C-SAVE section. A little under 6-months after delivering the initial site redesign for the National Cyber Security Alliance‘s StaySafeOnline.org site, we’ve done it again. The initial project utilized an existing design from another firm. Mediabarn made some minor tweaks to the existing designs focusing on content organization and usability issues. We developed the site in Drupal, an open-source CMS, launching in late 2008. Since the initial launch we have continued to support NCSA with their site content needs and adding several bits of new functionality. The latest redesign brings a major new face lift to the site without changing the overall structure of the site and it’s navigation. None of the content stored in the Drupal CMS was effected by the new design, requiring zero republishing of content. The new design was delivered as fresh Drupal Theme, actually a Zen sub-theme, in under 2 months from concept to completion. With this redesign we also launched a new site section, Cyber Security Awareness Volunteer Education Program (C-SAVE) . This project was and continues to be extremely fun to work on. Look for more on this project in the near future. Make sure you check them out. Posted in Development, Drupal, launch, Zen Theme. ← Consumer Guide Automotive is live!